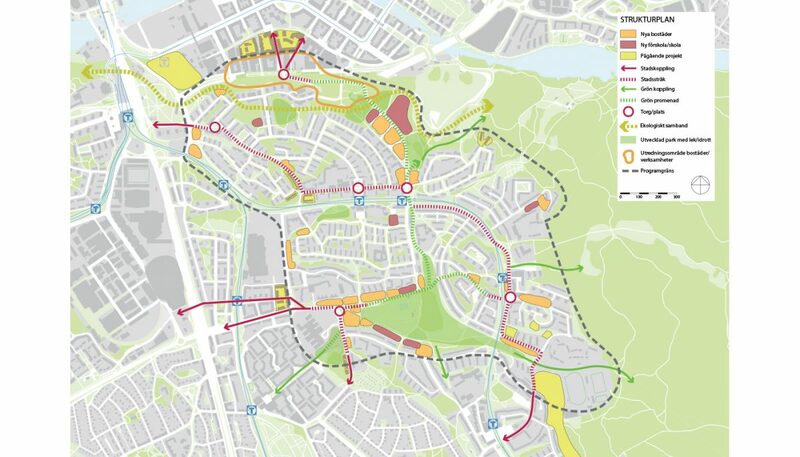 Illustration from the new district Hammarbyskogen. Hammarbybackens silhouette is visible to the right. Architectural support for the planning program. Material for the consultation in planning 2013-2014. The planning program was approved by the city planning office in June 2016. Continued studies of Sjöstadshöjden: the connection between Hammarby Sjöstad and Hammarbyskogen as well as Hammarbyskogen in 2017. 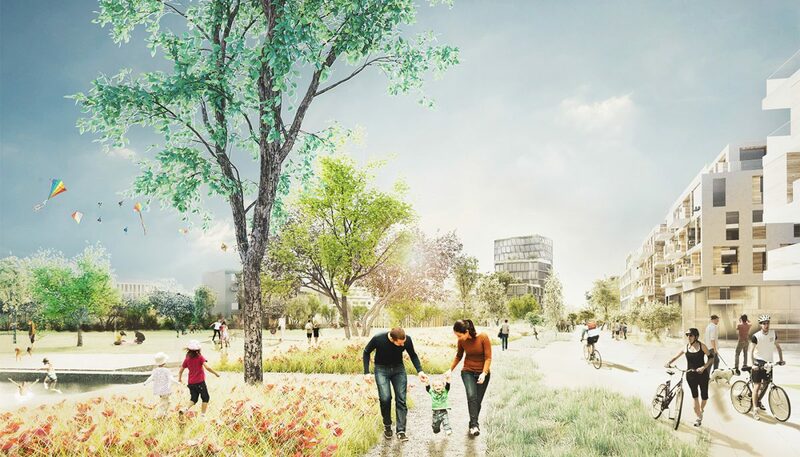 Tovatt Architects and Planners has assisted the city planning office with producing material for a program about the development of Hammarbyhöjden/Björkhagen in 2017. The program consists of several strategies and visions for developing the districts and how they should connect to adjacent districts. The potential for new development, identified in the program, is 2500 dwellings in total. 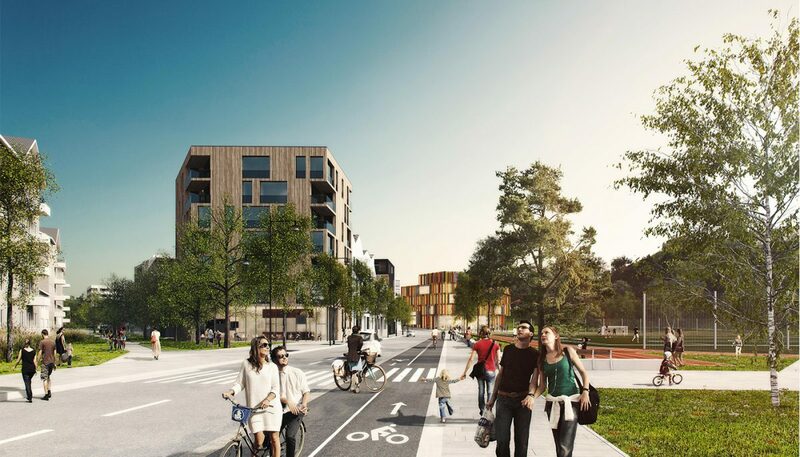 Two main areas have been studied in more detail: First, the connection to Hammarby sjöstad with a decking of Hammarbyvägen, handling the big height differences and the buildings in Hammarbyskogen. Secondly, the development of Nytorps gärde, with a strengthened connection to Söderstaden and the district Dalen. In addition to that, several smaller densifying projects has been identified, among others, a development of Björkhagens Center. Tovatt Architects and Planners has led the work with sketching structural plans and strategies as well as producing illustrative material, such as plan illustrations, diagrams and visualizations. The office has been part of the city’s project group and realized the groups thoughts in sketches and drawings. The work has also included extensive calculations of areas and number of apartments for the whole planning program. During 2015 and 2016, Tovatt Architects and Planners also produced urban planning principles for the different districts, that were later added to the planning program. These principles work as a bridge between the planning program and the work with the detailed development plans and the land allocations. 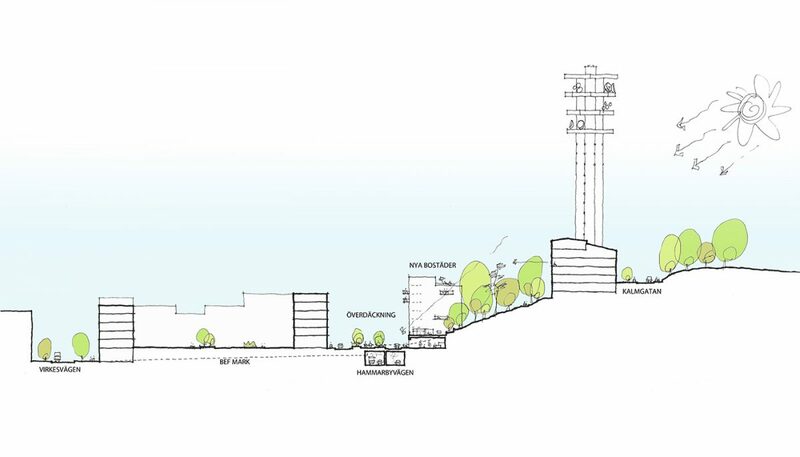 In 2017, the office assisted in creating more detailed sketches of Sjöstadshöjden and Hammarbyskogen in preparation for the coming detailed development plan process. The new buildings at Nytorps gärde meets the park with an attractive activity stretch with new sports-and play facilities. Section through Hammarbyvägen. Different options for connecting the districts were studied.